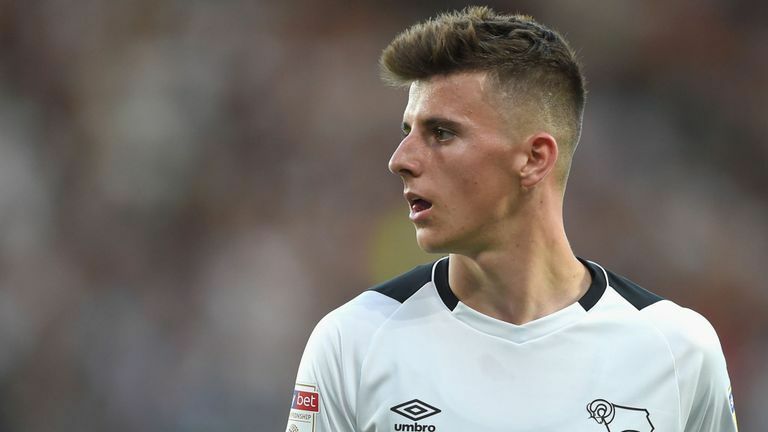 Frank Lampard and Mason Mount's alliance began at Chelsea several years ago and no one is a bigger fan of the thriving youngster than the Derby boss. "I know Mason really well from my Chelsea links and I have also watched him play in their very successful youth teams. His numbers are incredible for an attacking midfield player of his age and it's a massive coup for me to get him here." That was Lampard's opinion of his first signing at the Sky Bet Championship club in July as Mount joined on a season-long loan from Chelsea, just a few weeks after the Blues legend joined the Rams himself in his first managerial role. It certainly raised a few eyebrows. Just 19-years-old, Mount had not made a senior appearance for Chelsea and despite a Player of the Year season at Vitesse - where he scored 14 goals in 32 games - he was unknown in England. Apart from inside the Chelsea camp, that is. Mount was part of a team that won two FA Youth Cups, the U18 Premier League and the UEFA Youth League. That is when the comparisons with Lampard began. "That is the goal. That is where I want to end up," Mount said in September when asked if he saw himself scoring Premier League goals on the same basis as his Derby manager. "I wanted to test myself in the Championship. People say it is one of the toughest leagues in the world and you are playing so much, I just wanted to test myself." So far, Mount has passed that test with flying colours. The midfield maestro has been involved in more goals and created more chances than any other Derby player this season. "He can be really good, he can be top, top level because he's 19 and plays with ability and quality, technically he's brilliant but also his work-rate shouldn't go unnoticed," Lampard said after Mount's goal and assist helped Derby to a 2-0 win over Preston in August. "He's so quick to leave midfield to go and press people whether it be defenders or deep-lying midfield players which makes you the all-round midfield player. "He should never be considered a No 10 because there's so much more to his game but he'll score goals like a No 10. "At some stage he will go back to Chelsea, I don't want to think about that now, but when he does I think he's going to be a contender." At some stage he will go back to Chelsea, I don't want to think about that now, but when he does I think he's going to be a contender. Chelsea and Derby fans are excited, but England supporters should be too. Mount has played for England at every level since U16 - winning the UEFA European U19 Championship - in which he was handed the Golden Player award and was named in the team of the tournament. After his recent goal-scoring debut for England U21s, it may not be long until we see him playing alongside Harry Kane and Raheem Sterling, especially after he was invited to train with the senior squad a few days before the World Cup in Russia. "It was like 11:30 at night, a couple of days before a game and I got a call from my U19s manager and I didn't answer it because I was about to go to sleep," Mount said. "Then I got a call from the Academy manager at Chelsea and thought 'I wonder what is going on here, something must be happening'. "So I called my Dad and asked if he knew anything, he said no and told me to call them back so I called my England U19s manager back. Watch the games with commentary on the red button and the Sky Sports mobile app... find out how. "He said 'Gareth Southgate wants you to come in and train for four days before the start of the World Cup.' It was quite a surreal thing to hear and I couldn't believe it at first." Keeping up his form for Derby will be crucial for his international hopes. So far, he has started every Championship game for the Rams, who are next in action at home to Blackburn on Tuesday. Mount has become a fan favourite at Pride Park, making a goal-scoring debut away at Reading on the opening day of the season as Lampard's side came from behind to win the game in injury time. "The big thing for Mason is that he is playing regularly," England U21s manager Aidy Boothroyd said. "He's not just a starter, he is finishing games too. He is scoring goals and creating goals." Mount has also been prolific in the Carabao Cup, finding the net in Derby's opening two rounds, while the Rams travel to Manchester United in the next round. His sweet half-volley from just outside the box sealed a win over Oldham while he skilfully rounded Hull goalkeeper George Long in a big 4-0 away win in August. It has been a successful start for both Mount and Lampard. The former Blues captain, in his first season of management, is similar to his star player in that they are both still learning on the job. Lampard won everything there was to win at club level in England as a player. Three Premier League titles, four FA Cups, two League Cups, two Community Shields, a Champions League and a Europa League. It is unknown what he may or may not achieve as a manager but it at least seems fitting that Lampard is now setting the stage for Mount, who has already racked up a few trophies at youth level, to show what he can do on the big stage. Watch Derby County v Blackburn Rovers in the Sky Bet Championship live on Tuesday night on Sky Sports Football via the red button, and in our app.